While this classic holiday flick is typically associated with Christmas, Miracle on 34th Street opens with the Macy's Thanksgiving Parade in New York City and spans the entire holiday season. The movie stars a young Natalie Wood and was a smash hit when it was released in 1947, and the upbeat story and heartwarming message of generosity has continued to draw a legion of new fans for more than 65 years. This film is essential viewing if you're heading to New York City for the holidays, as it single-handedly made the annual Macy's parade an American institution. 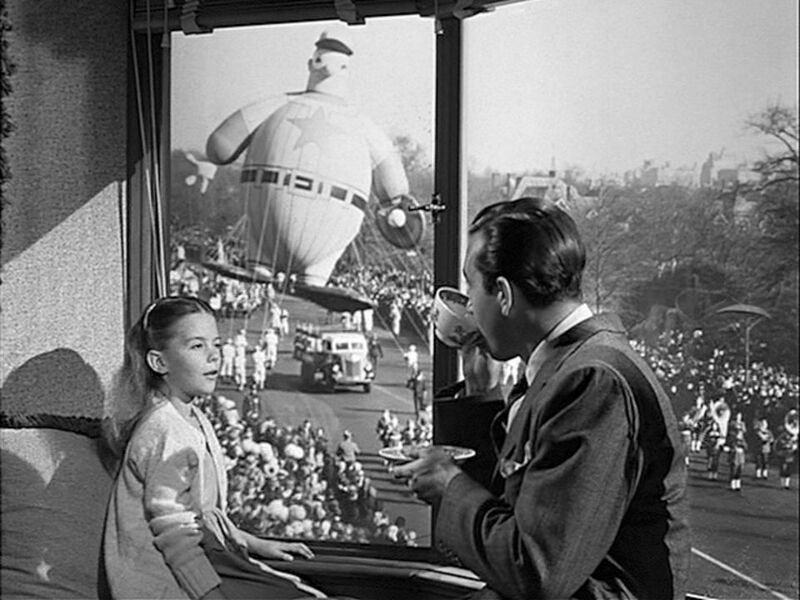 Before the film, the parade was a local tradition that was broadcast within a small region. National television coverage started in 1948, the year after the film's release, and has been a Thanksgiving tradition ever since. In this Thanksgiving episode of Bewitched (season four, episode 12), Aunt Clara zaps the Stephens family to Plymouth at the time of the pilgrims. When Darrin lights a modern match to create fire, he is put on trial as a witch. Ironically, Samantha uses real witchcraft to prove his innocence. When Peppermint Patty invites herself and the entire Peanuts gang to Charlie Brown's house for Thanksgiving, chef Snoopy and pilgrim Woodstock carry the day in this Emmy Award winner. Tip: You also can view this and other films on this list with the Amazon Fire Stick. In this Thanksgiving episode of WKRP in Cincinnati (season 1, episode 7), Mr. Carlson decides to create a big Thanksgiving Day promotion. His idea? Get a helicopter and drop live turkeys on the citizens below. This Thanksgiving episode originally aired during Cheers's fifth season, episode nine, in 1986. As the holiday approaches, most of the Cheers gang finds themselves with no plans and decide to celebrate together at Carla's house for a Thanksgiving dinner of frozen turkey and overdone peas. The hilarity that ensues leads to one of TV's most memorable food fights. A classic Thanksgiving comedy, this mismatched buddy movie stars Steve Martin as an easily aggravated everyman forced to travel with an oversharing salesman (John Candy) in order to make it home for the holiday. It's wonderfully cast and hilarious. This episode of The Simpsons originally aired in November 1990 (season two, episode seven) and has become a cult classic. On Thanksgiving, Bart gets into a fight with the family and runs away from home. Afterward, he shares a turkey dinner with homeless people at a soup kitchen and learns the true meaning of the gratitude in the process. Years before Modern Family, Ed O’Neill starred as Dutch Dooley, a working-class good guy with a new uptown girlfriend he wants to impress. When the woman’s spoiled son (Ethan Randall) refuses to come home from prep school for Thanksgiving, Dutch volunteers to pick up the boy for a road trip back to Chicago that goes downhill fast. People commonly think of the first Thanksgiving as the harvest celebration enjoyed in 1619 by the Pilgrims in Plymouth, Massachusetts, yet 10 years earlier the Jamestown survivors also held a Thanksgiving celebration when the supply ships from England finally arrived. It is likely that Pocahontas attended that celebration. Holly Hunter leads a fabulous ensemble cast in this acclaimed holiday comedy-drama about a woman who's experiencing a string of bad luck as she heads home for a dysfunctional family holiday gathering. It co-stars Robert Downey, Jr. and is directed by Jodie Foster. In this Thanksgiving episode of Friends (season eight, episode nine), Monica invites her high school friend Will (special guest star Brad Pitt) to Thanksgiving dinner with the gang, unaware that he dislikes Rachel. Meanwhile, Joey vows to eat the entire turkey single-handedly while Chandler and Phoebe pretend to watch football on TV in order to avoid helping in the kitchen. In this Thanksgiving episode of How I Met Your Mother (season three, episode nine), Lily and Marshall host their first Thanksgiving as newlyweds, while Barney is tortured by a slap bet. This Thanksgiving episode of Modern Family originally aired in 2011 (season three, episode nine) and has become a holiday favorite. Pre-holiday squabbling comes to a head at Thanksgiving with the family divided between the "Dreamers" and the "Pritchetts"—and deciding to settle the score with the punkin' chunkin' challenge.